← The spirit of the common man [human being]…is anything but stupid !!! Halloween time is mystical lights, shadow and darkness which now play with humanity. Death, pain and fear are presented now before us as our shadow. The film Hellraiser brings this all to an audience. 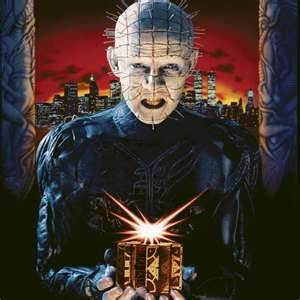 Yes, Halloween time is “Hellraiser” time. Cable, Netflix or old TV re-runs. Clive Barker’s creation is a thrill to a generation of horror dorks. He creates a box that opens the world to hell. The Cenobites don’t see it this way. Pinhead defines the Cenobites as, “demons to some… …angels to others.” The film begins with the statement, “What is your pleasure?” It pivots on Julia Cotton’s desire to be with her brother-in-law. It is because of her that Frank Cotton is resurrected and the Cenobites are called back through a magical box. Kristy Cotton is the heroine of this film. She hates her mother-in-law who desires her uncle Frank. He abused Kristy and so she summons the Cenobites to tear Frank’s soul back apart. Julia is killed by Frank. This film is about blood, gore, and dead people. It was released in 1987 and is the building block for the over-saturated horror films of our current generation. More influential than Texas Chainsaw Massacre or Suspiria. 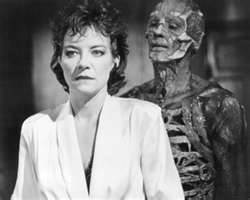 Hellraiser’s plot is about desire gone bad; so people die and suffer becsue of this.. This is due to the desire of one woman’s memory of a clandestine affair. Dark feelings and unbelievable gorry impressions dance throughout this film, and this is what haunts us. Julia and Kristy are in opposition to each other. The cold shy personally of Julia is evident. Her conservative sexuality is ready to burst forth. All the characters in the film notice this about her, even her husband is on a tight leash. Kristy has a different projection. She looks androgynous and glows with a superimposed image of both Jesus & Krishna. The Cenobites are awesome and scary. Their directive is simple and the same as the plot of the film which is to bring pleasure or pain. Frank wants both. He gets his pain and pleasure. His desire and dark passion are very clear. The Cenobites are cold and as calculating as surgeons. They hear the call to serve without emotion or desire and abide by a law foreign to their viewers. Happy Halloween: An essay using the Third person. This entry was posted in "In the beginning there was a void except for the written word." The Avengers (Band), Records, CDs and anything to review that i want toooooooooooooo!! and tagged angel, Carl Jung, current-events, demons, drama, Halloween, Hellraiser, Horror, postaday, third person, Underground. Bookmark the permalink.